The following recipe is so quick and simple to prepare it is a staple midweek meal at Casa B, and one that the kids will always finish without any fuss. It is also one that won’t break the bank using mostly store cupboard ingredients. Gently bring your pasta to the boil in a large saucepan and then simmer for 8 minutes. Meanwhile pour a little of the sunflower oil from your tin of tuna into a frying pan and heat. Once heated gently fry your shallots and garlic until softened. Add your drained tuna to the frying pan and fry gently for 3 minutes. Add your tinned tomatoes, herbs and a crack of black pepper to the frying pan and simmer gently for 5 minutes. Add your sweetcorn to the pasta and continue to simmer for five minutes before draining. Return your pasta and sweetcorn mix to the saucepan and pour on the contents of the frying pan. Mix thoroughly and pour into a casserole dish. Sprinkle the grated mozzarella across the top and bake for 30 minutes. Because we cook this for our small children we omit salt but this could easily be added with the herbs and pepper if required. As always, if you do try this out please let me know how you get on in the comments below. My son won’t eat any pasta other than macaroni cheese – but he loves tuna. So I’m definitely going to give this a try. A fabulous easy family meal, great for days when I don’t have much time to cook. Yes this is a super quick one to get ready. My kids would eat this as they love pasta.As we don’t eat meat etc I haven’t bought tuna in a very long time.I think I’ll put this on the menu for next week so I can have a vegan nut dish. 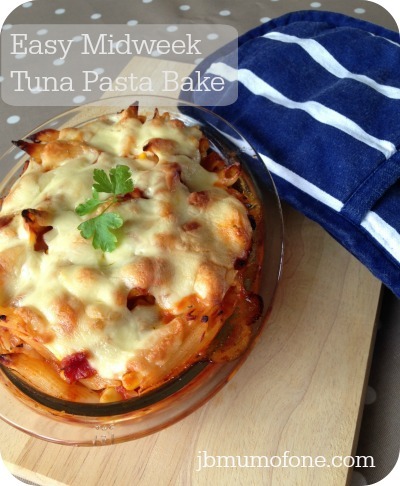 Love pasta in every way but baked looks really yummy!